Joe Cash moves bagels to the boiler at Bageladies in Waynesboro, VA. Photo by Norm Shafer. 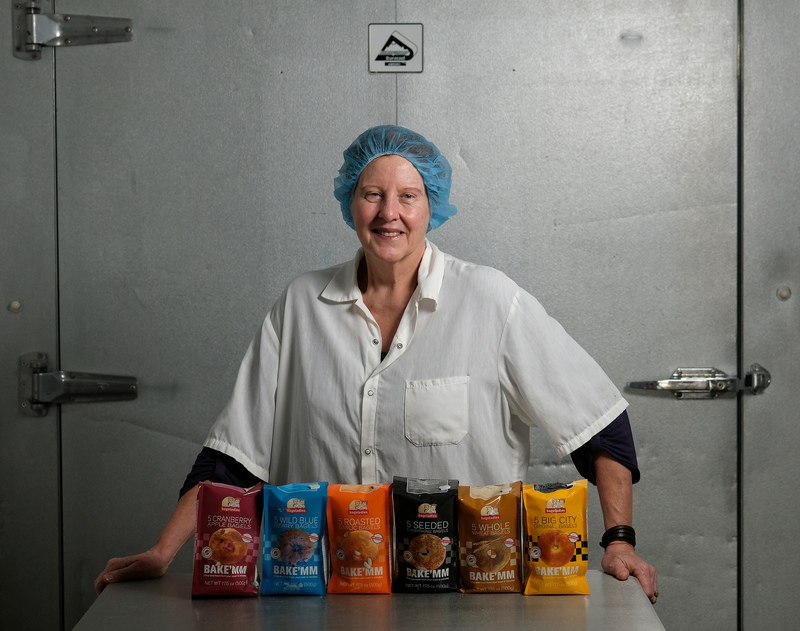 When Janet Dob wanted to invent a bagel that could build a better world, she had a few things in mind: healthy and nutritious food, a worthy business plan, and a winning strategy to avoid the up-before-the-sun hours of traditional bakeries. Her quest took her through hundreds of years of baking history and among formulas for bagel-making that span continents. Ultimately, she arrived at a unique process (she still holds the patent) that includes all of the traditional steps of rising dough, boiling bagels, and oven roasting to perfection, but in a manner that pauses the process between boiling and baking, allowing her customers to enjoy home-baked bagels in minutes in the comfort of their own kitchens. Even better, Bageladies Bagels boast 60% fewer sugars than traditional bagels and zero wheat starch glucose, making them a perfect low-glycemic food for healthy blood sugar response. Best of all, Janet can sleep in. Janet Dob works in her office at Bageladies in Waynesboro, VA. Photo by Norm Shafer. 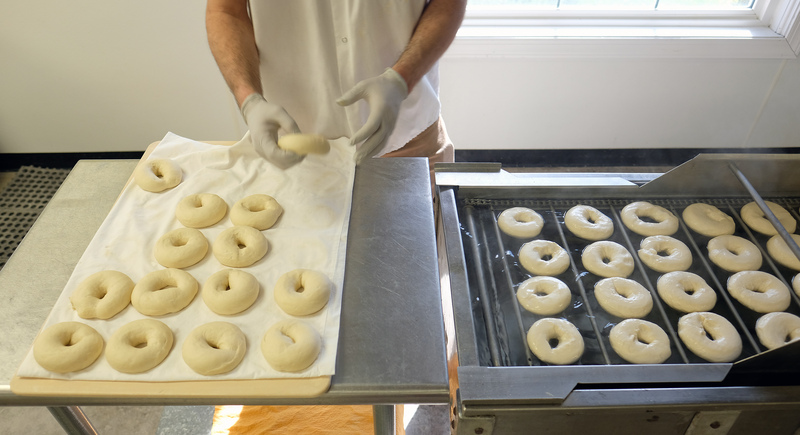 Testing, patenting, and building a production line for her bagels took years, and Janet has grown her business through time at the NewBiz Virginia Business Incubator to her current manufacturing center in Waynesboro. 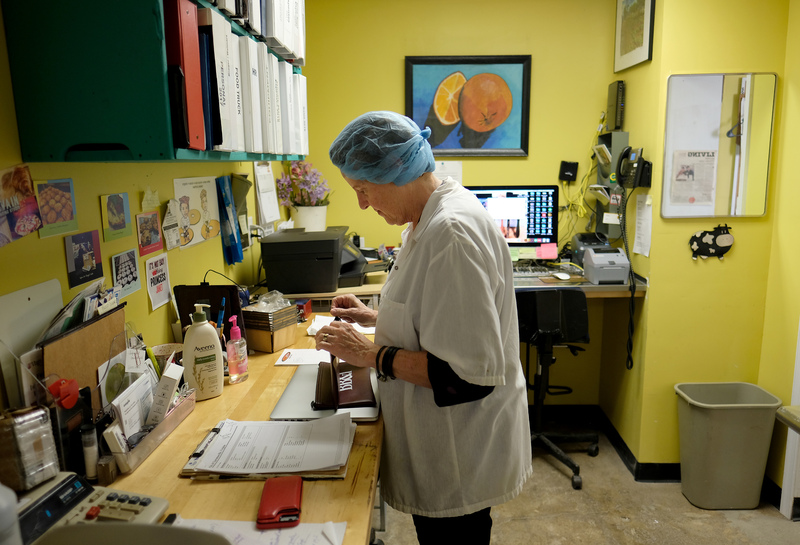 But grocery and food manufacturing margins are incredibly narrow and as a business occupying “the space between big venture money and tiny start-up financing,” Janet knew she was going to need to invent, yet again, her own formula for success. Enrolling in a 16-week compressed MBA for established business, she began building a five-year plan that focused on scaling for growth. The result is the Bageladies’ new two-pronged approach. On the wholesale branch, Bageladies continues to produce and sell bagels to grocery stores. Their growing retail branch features brand-building and direct-to-customer relationships, including a presence at the City Market in downtown Charlottesville and their new Bagelini Bus — a portable way to find their signature bagel sandwiches at festivals, breweries, and food truck parks, beginning in 2019. Without large-scale venture dollars to simply buy grocery store shelf space, Janet see this approach as allowing her business to grow wherever there is traction, and to leverage successes and customer awareness in one arena with additional sales and demand in the other. “We spend our days balancing grocery store shelf fees, long-range financial planning, and bus painting,” says Janet, reflecting on the wild ride of small business entrepreneurship, where her role as CEO means providing both strategic direction and nitty gritty bus detailing. Janet Dob shows off some of the varieties of bagels that her company, Bageladies make in Waynesboro, VA. Photo by Norm Shafer. For many of her customers who are diabetic, Bageladies Bagels are the only real bread they eat. In other cases, Bageladies has changed their recipes to accommodate parents of children with severe allergies, and today (other than wheat) their factory contains no other major allergens to threaten cross contamination. Janet knows her business is not the high-tech model so intriguing to venture capitalists, but the hugs from customers at the Saturday market sustain her in a different way, and she hopes to see the continued growth of a regional angel network that understands the potential in long-term, bread and butter enterprises.